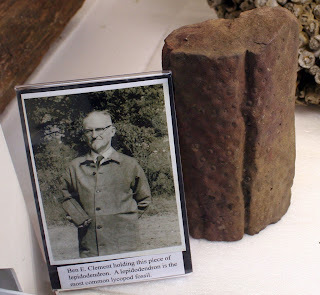 If you are in the area of the United States of western Kentucky or southern Illinois, consider visiting the Ben E. Clement Mineral Museum. 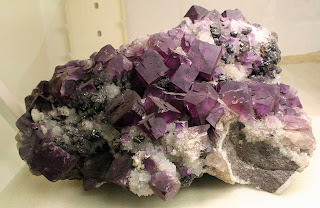 This museum houses an amazing collection of world-class fluorite mineral specimens plus other mineral specimens, mining equipment, historical materials, and a few fossils. The majority of specimens were obtained from the fluorite mines of the area that operated there in the 20th century. 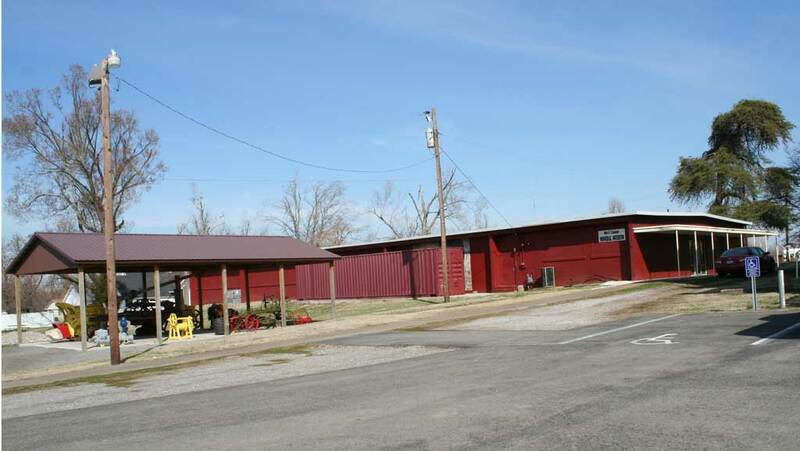 The map below will give you an idea of the museum's location at 201 North Walker Street, Marion, Kentucky. This posting is about the few fossils on display at the museum. 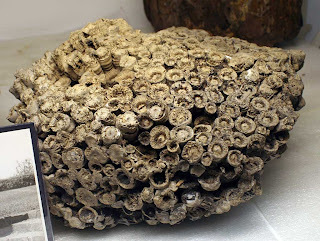 Mr. Clement found two museum grade colonial corals on display in the main fluorite specimen room. 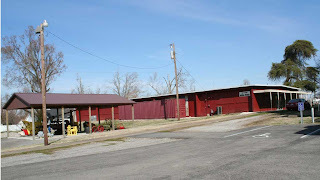 The museum building is shown in the next photo along with a pavilion that covers large mining equipment. 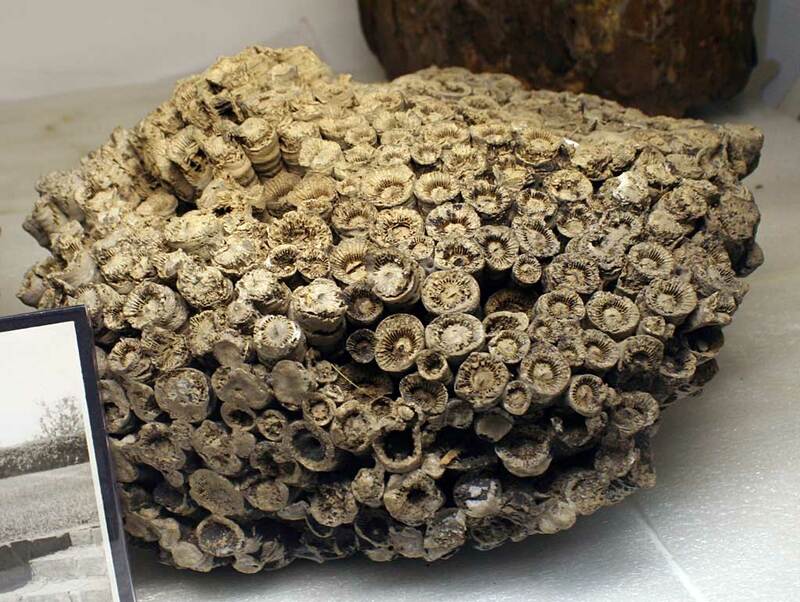 This photo shows part of a Pennsylvanian Period plant fossil along with the second colonial coral. 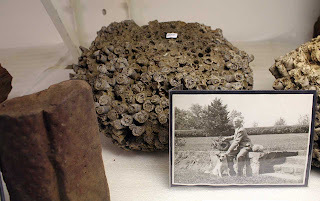 A picture in the foreground is of Mr. Clement with his 3-legged dog next to a rock wall built with local area rocks. Picture of Ben E. Clement holding a lepidodendron fossil with the fossil on display. 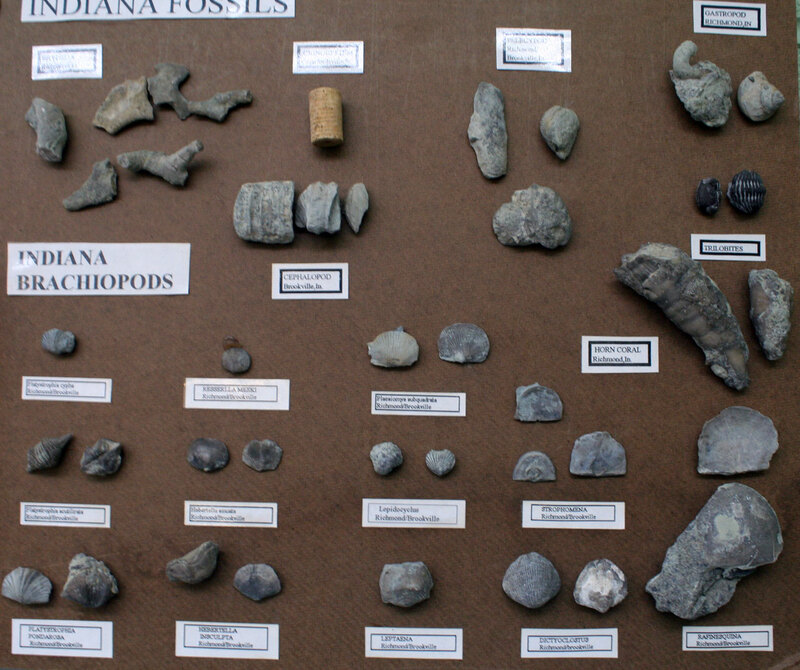 A donated display of Indiana invertebrate marine fossils looks like most of the fossils are from the Ordovician Period though the crinoid stem piece is Mississippian and the trilobite is probably a Devonian Phacops. Just a sample of the hundreds of fluorite specimens on display in the museum. This one is probably over 30 cm in length. The displays allow you to get very close to specimens to see the mineral details unlike those at the Smithsonian. 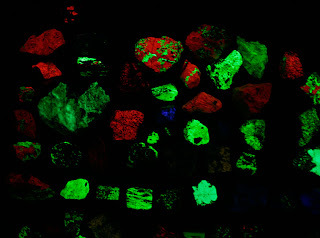 Another popular attraction at the museum is the fluorescent mineral room with a lot of specimens from Franklin, New Jersey. 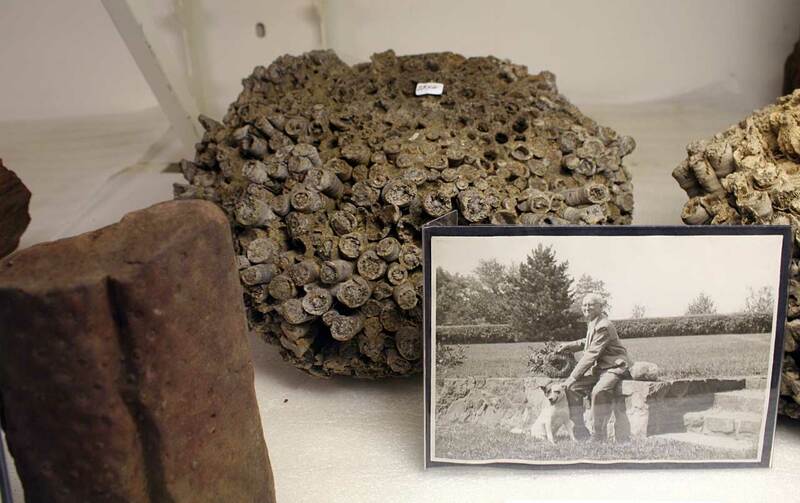 Mr. Clement traded fluorite specimens for material from New Jersey thus amassing quite a collection. 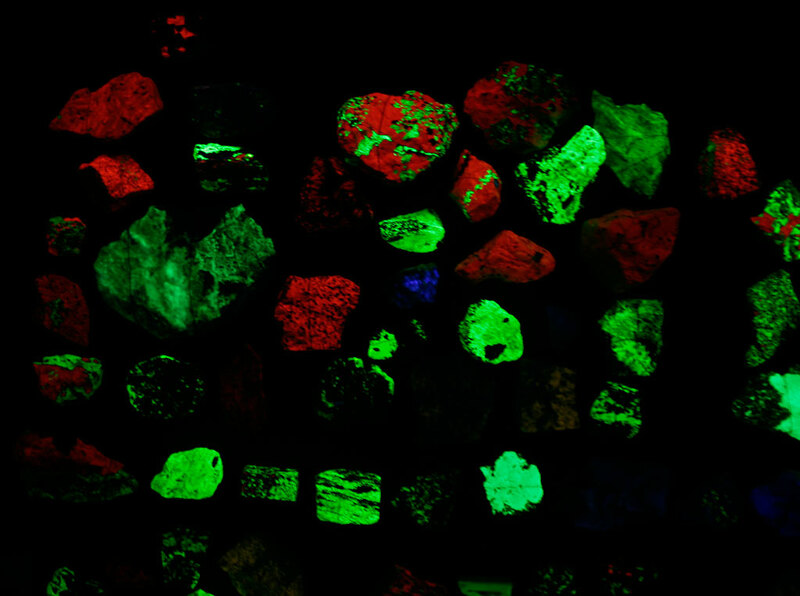 Also on display are the fluorescent material from Kentucky. It has a nice blue glow plus other colors.